Basking in the late summer evening sun, Cadgwith seems unchanged by the passing centuries. Still a huddle of thatched cottages and an old inn cluster round the cove. Only the boats have changed. 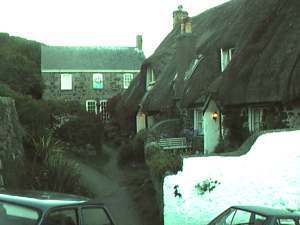 Despite its picture-book beauty, Cadgwith is a working Village. This is a main part of its appeal. As always, fishing is an important part of the local economy. Although in these days of ever reducing quotas and restrictions it is increasingly difficult to live by fishing alone. These days the main catch is not pilchards but crab (several tons each week), lobster, mackerel, monkfish, shark and mullet. If you like your fish fresh, you will sometimes be offered fish just off a returning boat. Also freshly prepared crab and lobster can be bought from the Crab Shop. 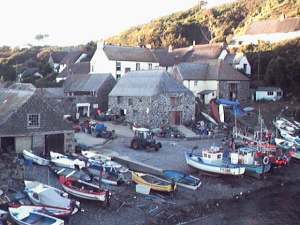 At the head of the cove you will find The Cadgwith Cove Inn, the heart of the village's social life. Of an evening, fishermen, farmers and shopkeepers gather to celebrate or commiserate, depending on the fortunes of the day. On Tuesday nights there is folk singing and traditional(ish) Cornish singing on Fridays. Next door to the Inn you will find The Old Cellars restaurant. 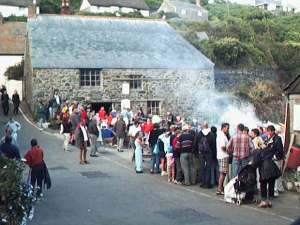 Once one of the cove's pilchard cellars, where the fish would have been pressed, salted and packed, this is now a popular seasonal restaurant. In the cobbled courtyard you can have snacks and cream teas or a full evening meal (a personal recommendation is a "clotted cream jam doughnut"). At the centre of the cove is the Pilot Gig Club. It is based in the old lifeboat house, active for nearly 100 years before closing in 1963. A board in the entrance to the Old Cellars lists the many rescues carried out by the Cadgwith Lifeboat. On most evenings from May to September you can see the gig teams practising. They also hold open sessions on Sunday mornings, for anyone interested to join in. The Gig Club has recently refurbished their building (aided by a Heritage Lottery Grant), donations to funds are always welcome. Inside, displays give details of the Lifeboat House history and the history of Gig racing. Next after the Gig Club is The Watch House. Originally built as the Cove's customs lockup and boathouse. The small black-painted hut, overlooking the cove, was probably the customs look-out. A row of cottages up the hill above the cove housed the customs men, while the officers lived in Ship Cottage. The local people did not approve of the customs men (to put it mildly), so the customs men would have been brought in from other parts of the country. Behind The Watch House are Dolphin Cottage and Kiddleywink. These thatched cottages were originally another of the cove's pilchard cellars. During the 1950s, the famous concert pianist Harriet Cohen lived in Dolphin Cottage. It is said that she could be heard practising, although it is difficult to see how a grand piano could fit in the tiny parlour, and would Harriet Cohen accept an "upright" piano? Tucked away behind Kiddleywink, is Ship Cottage, distinctive for the painting of Socoa (one of Cadgwith's famous shipwrecks) in full sail. The Cottage opposite Dolphin Cottage once had a small shop attached. 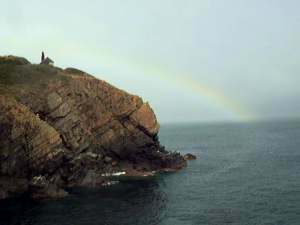 A small headland, called the Todden divides the cove into two, with the fishing cove on one side and Little Cove (commonly called the "swimming cove") on the other. The seat on the Todden is a popular spot to sit and watch the activity in the cove. Heading back towards the centre of the cove, there is a cluster of fishing sheds, housing two art/craft galleries and the Crab Shop. 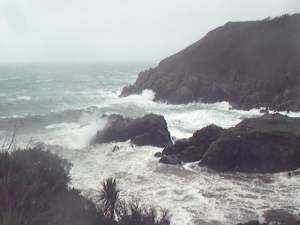 In the centre of the cove is the winch house, where an ancient engine used to haul the boats above the high tide line. The modern engine is not so pcturesque, but somewhat more reliable. A brand-new tractor has recently replaced the rusty old tractor used to push the boats into the sea and ferry their catch to the cold store. A previous tractor met a watery end when it continued, unmanned, into the sea! 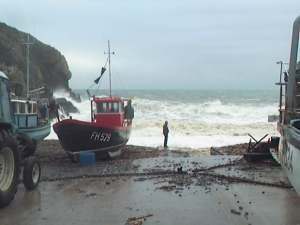 There is always something to see or do in Cadgwith, all year round. The Winters are mild and often sunny. Even the storms can be spectacular to see, although the buildings at the head of the cove all need some protection from the waves that have been known to sweep across the road. All text and images used in these web pages are copyright (c) 2005 and may not be copied or used without permission.